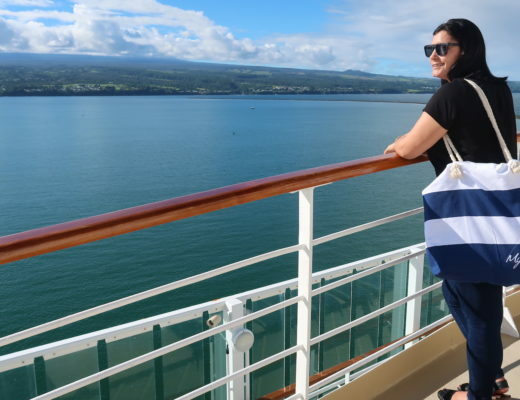 Let’s face it, we all have better things to do in Hawaii than drink bad coffee! 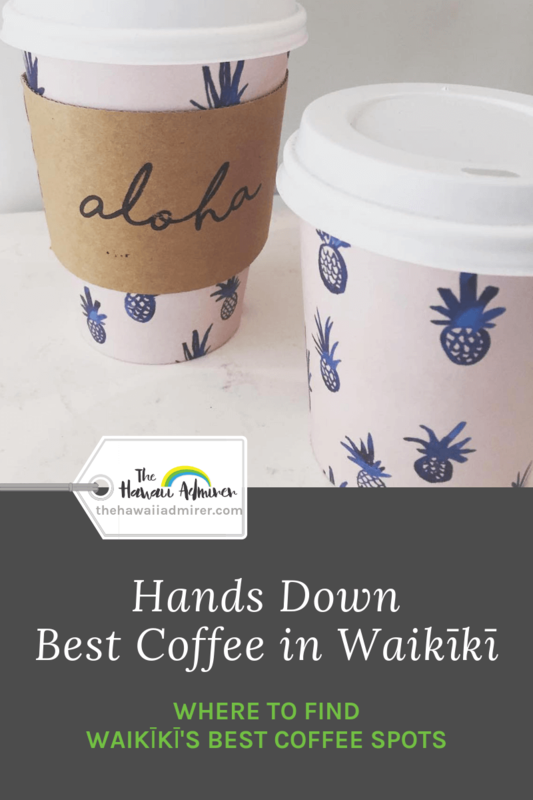 Let me lead you to the best coffee in Waikiki. I’m no coffee connoisseur but I am from Australia, the land of coffee snobs. We’re the only country on the planet where Starbucks flopped, which shows you the high level of expectation we have for drinking quality coffee. Hawaii’s coffee game is strong. The mineral-rich volcanic soil and ideal climate make it perfect for growing coffee plants. In fact, Hawaii is the only U.S. state to grow coffee plants commercially. 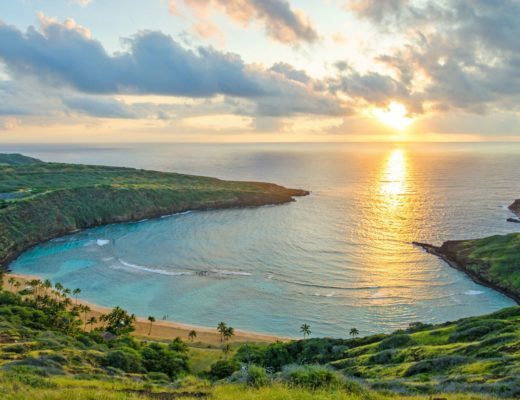 It’s also world famous for coffee beans cultivated in the Kona region on Hawaii, the Big Island. So make sure you don’t leave without trying at least one Kona brew! 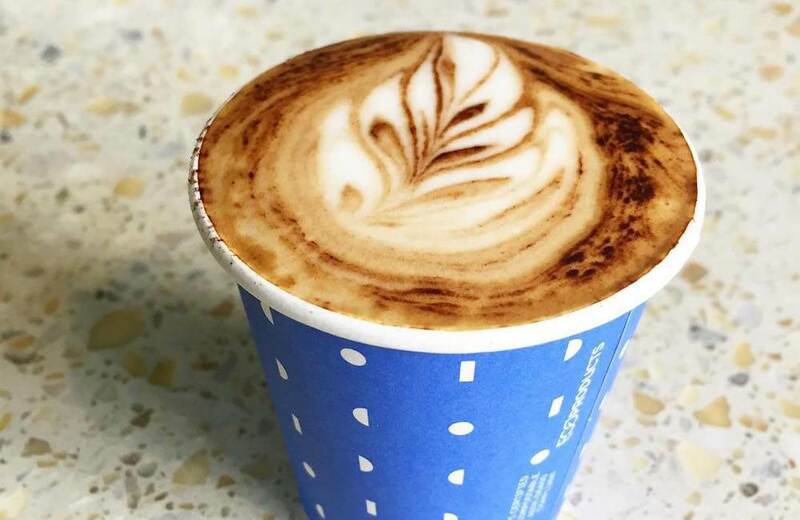 While the Hawaii locals are used to drinking drip coffee (eek), holidaymakers tend to seek out their familiar espresso-based beverages. 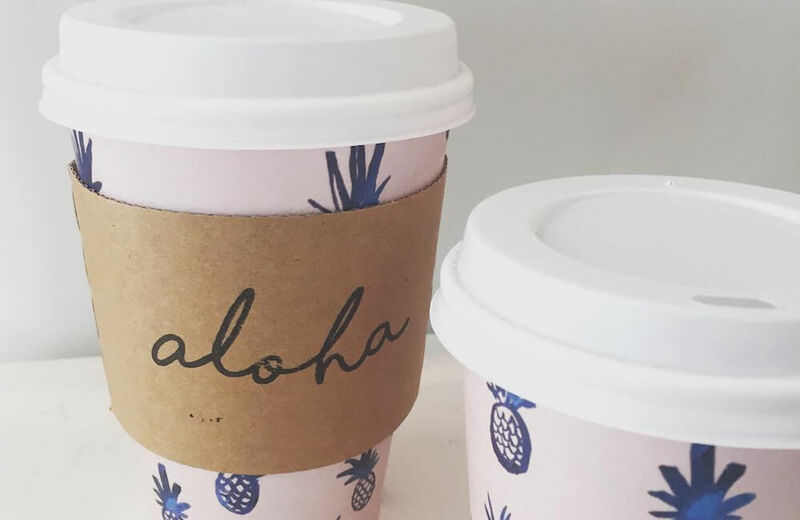 I’ve sipped my way around Waikiki to find the best non-drip coffee available, hands down. *I drink a flat white or I’ll substitute with a latte. Please note: The previous number one coffee spot Fueled Downunder has sadly closed down indefinitely. Find it in the atrium of the Hyatt Regency Waikiki Beach Resort & Spa. 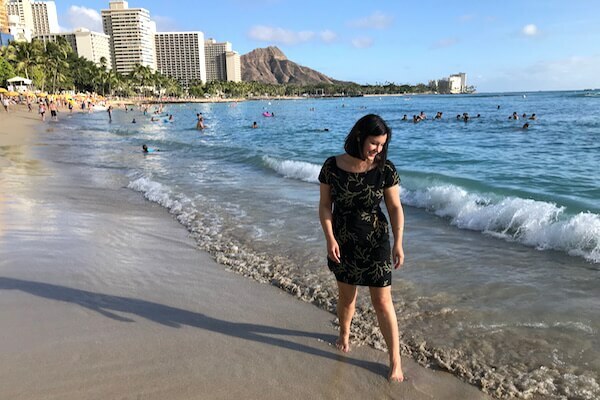 Find it at Alohilani Resort Waikiki Beach on Waikiki’s main street. 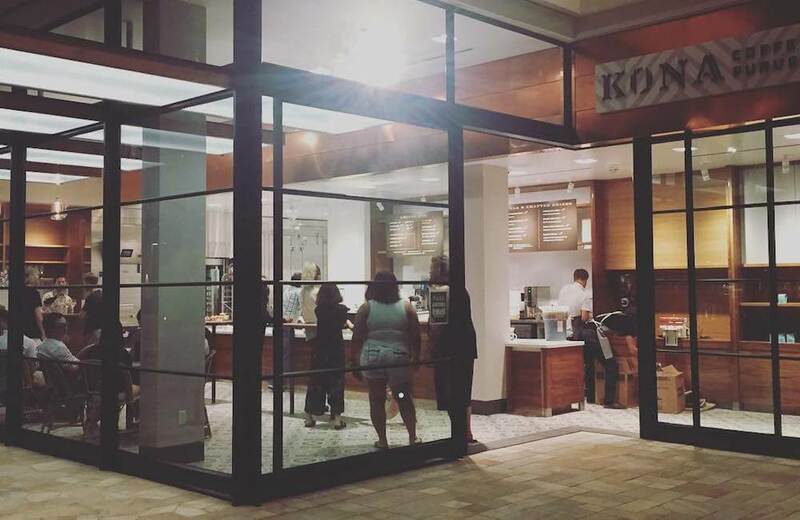 Kai Coffee Hawaii is a locally owned and operated family business that serves artisan roasted Hawaiian coffee and specialises in training Baristas. It’s friendly, relaxed and flavourful. Coffee beans are locally grown, the majority from Kona’s volcanic soil on hills that slope towards the kai (means ocean in Hawaiian). Milk cows, soy, almond, coconut and macadamia nut! Also known for Kai Latte (hot/iced), a macadamia flavoured latte with macadamia nut flavoured whipped cream. While you’re there relax to the sound of a nearby cascading waterfall and look out for the macaws (colourful parrots). Find it in the lobby of The Surfjack Hotel + Swim Club. 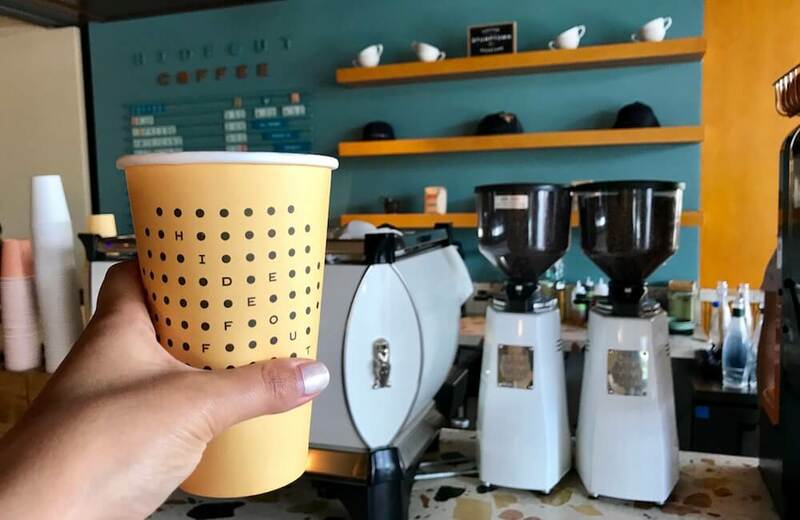 Olive & Oliver is a combined boutique and espresso bar, perfect for grabbing a fresh cup of coffee on-the-go. It’s welcoming, trendy and damn good. Coffee beans are supplied by Caffe Vita of Seattle, Washington. Milk cows, almond or coconut (no soy). Also known for art-infused coffee cups. While you’re there browse the on-site apparel shop filled with clothing and accessories reflective of Hawaii’s beach culture. 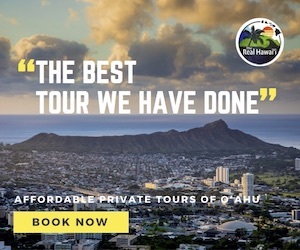 Find it a mile down the road from Diamond Head crater, a 20 minute walk from central Waikiki. Open Mon-Sat 6:30am-6:00pm; Sun 8:00am-6:00pm. 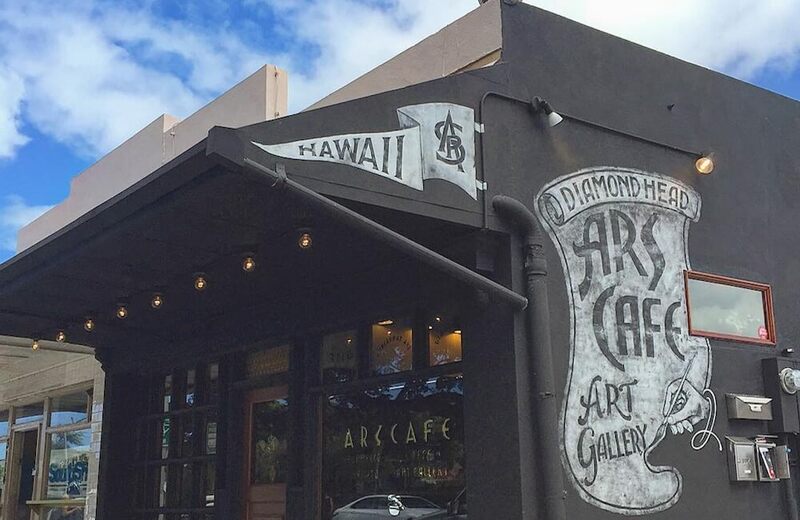 ARS Cafe Gallery celebrates ars – meaning art, skill and craft – by showcasing artists and their artwork within the cafe. Coffee beans are high quality and sourced from all over the world. Flat white if you ask, they’ll make it. Milk cows, soy or almond. Also known for homemade gelato. While you’re there check out their toast selection, I am obsessed with the Avocado Toast with pesto, beets, feta and basil. Find it at the top of the Kuhio Avenue escalators leading up to The Laylow hotel. Hideout Coffee is an awesome little coffee nook perfect for the coffee addict, open from dawn to dusk. It’s cute, retro-styled and caffeine-strong (all drinks are priced as doubles). Coffee beans are supplied by Stumptown Coffee Roasters of Portland, Oregon. Milk cow, soy or almond. Also known for the jiving open-air restaurant and rooftop bar just around the corner. While you’re there mosey on over to the reception desk to view an incredible hula dancer/nodder collection. 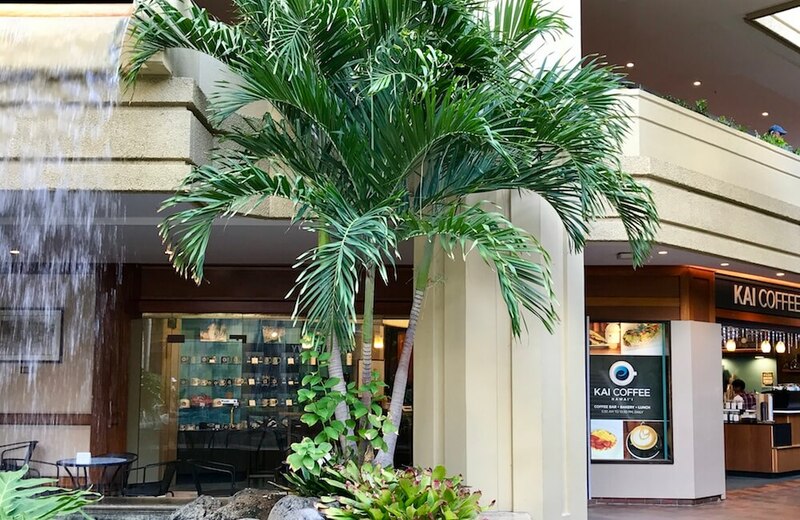 Find it at the top of the Kalakaua Avenue escalators leading up to the Waikiki Beachcomber By Outrigger hotel. 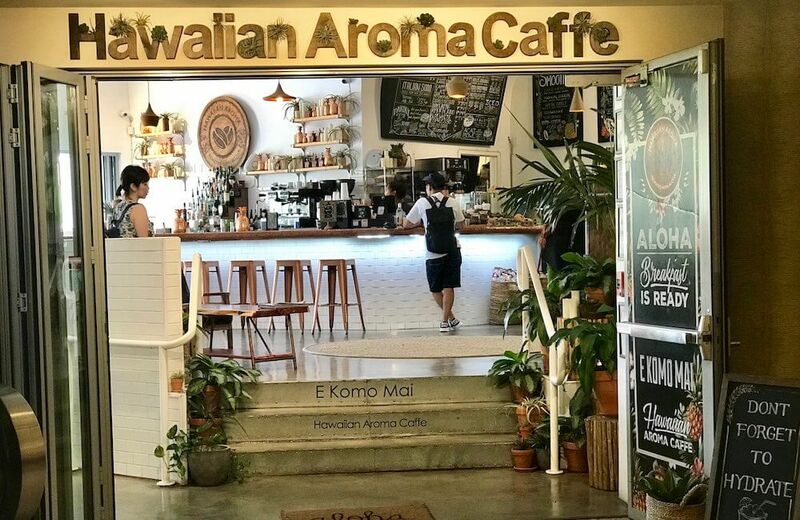 Hawaiian Aroma Caffe is a beautiful aloha-filled cafe-bar with four locations across Honolulu. It’s local, creamy (the coffee) and all the tropical feels. Coffee beans are a unique blend of Sumatran, Mexican and Guatemalan beans roasted at their Kapolei facility on Oahu. Also known for Italian Soda, waffles, next-level açai bowls and Okole Maluna (Bottoms Up) Cocktails. While you’re there cross your fingers, you might be lucky enough to experience their latte art! 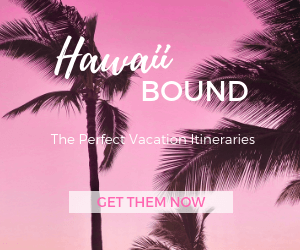 Find it inside the Queen Kapiolani hotel. 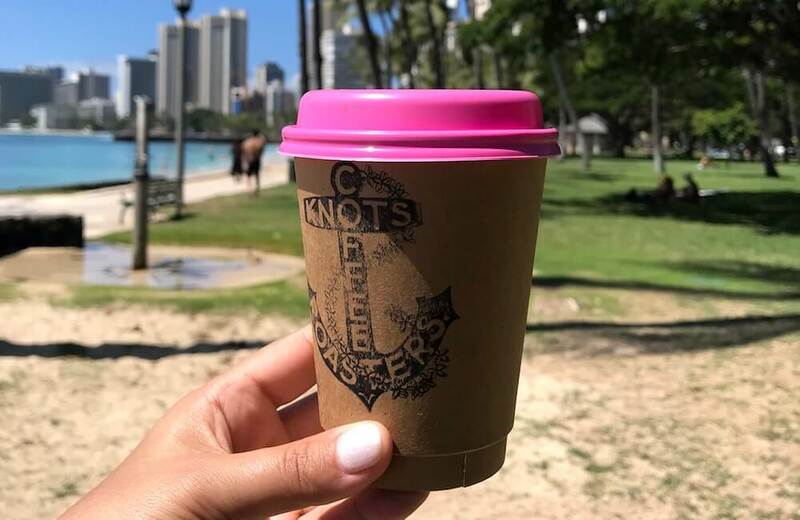 Knots Coffee Roasters features not only innovative coffee, tea and cocktail concoctions but all-day bites. It’s brand new, spacious and oh-so-yummy. Coffee beans are from the Daylight Mind Coffee Company on Hawaii, the Big Island. Also known for coffee by day and wines and small-batch local beers by evening. While you’re there make a mental note to return for Happy Hour daily 2:00-5:00pm. Find it at the Kuhio Mall Entrance of the International Market Place. Kona Coffee Purveyors has partnered with b. patisserie and opened a great little coffee spot at the International Market Place. It’s bustling, quality and mmm mmm. Coffee beans are artisan roasted from a fine high-elevation, single-estate in Kona. Milk cows, soy, almond and oat. Also known for serving incredible pastries and sweet treats, like pineapple coconut almond croissants! While you’re there wander around the 75 retail stores in the new and improved International Market Place. Find it on the second floor of the Royal Hawaiian Center, above the Royal Grove. 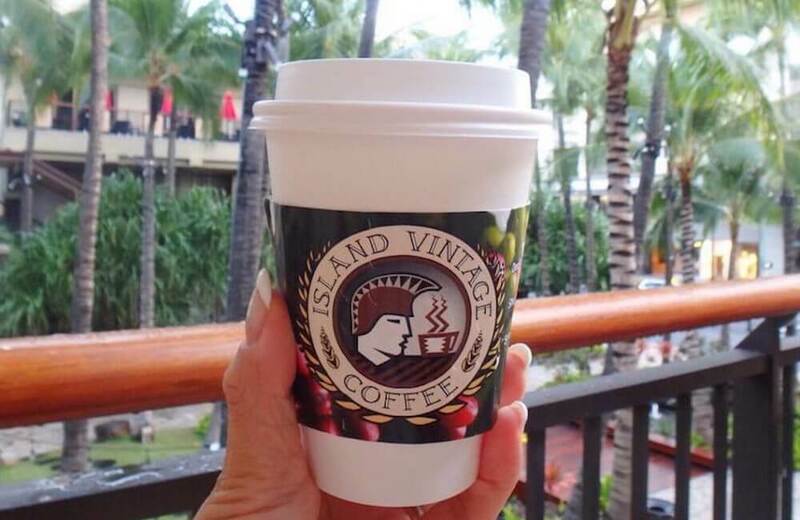 Island Vintage Coffee is a popular Hawaii coffee chain. This store is located at the Royal Hawaiian Center, in the heart of Waikiki. It’s central, buzzing and satisfying. Coffee beans are grown on the upper slopes of the Kona district on Hawaii Island. Also known for several varieties of the açai bowls, a popular breakfast item usually consisting of acai puree, granola, fresh fruit and honey. While you’re there take a break breakfast, lunch or dinner amongst the beautiful palm trees and native plants in the garden. Find it at the entry of the Moana Surfrider, A Westin Resort & Spa. Honolulu Coffee is a famous Hawaii coffee chain serving “farm-to-cup”. This store is located in the Moana Surfrider. It’s busy, efficient and quality. Coffee beans are grown on their prized Kona coffee farm, on the slopes of Mauna Loa volcano on Hawaii Island. Also known for sweet treats including cakes, pastries, cookies and macaroons. While you’re there ask for your coffee to-go and drink it on nearby rocking chairs or under the beachside banyan tree. 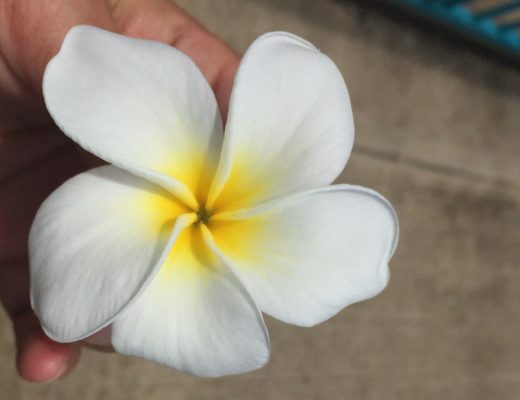 Find it near the pool at the Sheraton Princess Kaiulani Hotel. 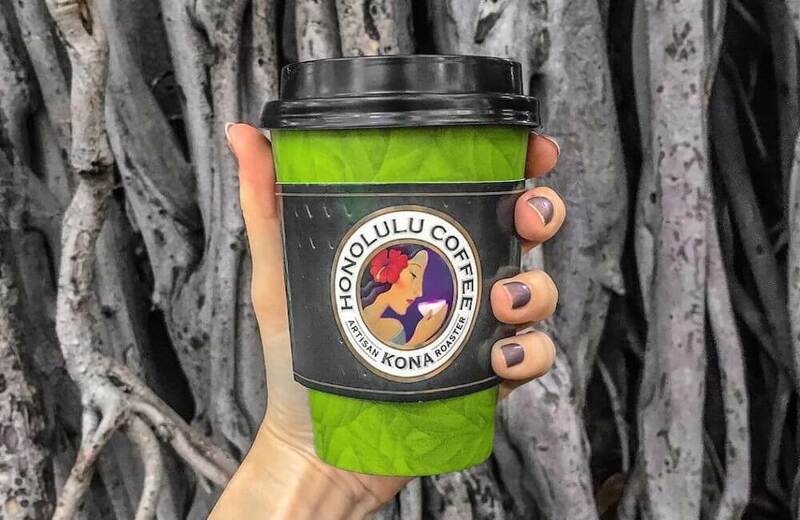 Aloha Coffee Company serves high grade Kona coffee from a small cart in central Waikiki. It’s outdoors, local and fresh. Coffee beans are from Kona on Hawaii Island, and roasted weekly to ensure flavour. Also known for serving Instapressed cold-pressed, raw juices. While you’re there meander other small carts in the area offering trinkets etc. Find it next to the Longs Drug Store at the west-end of Waikiki’s Kalakaua Avenue. 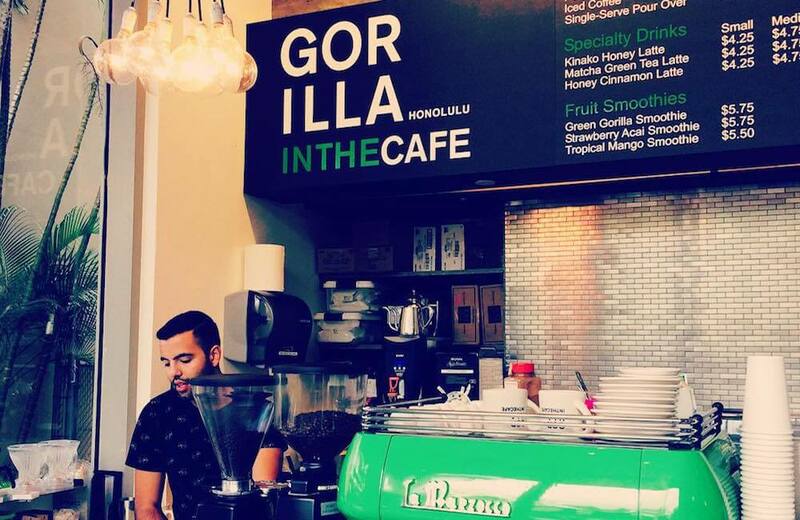 Gorilla in the Cafe is a gourmet coffeehouse opened by the Korean actor and restauranteur Bae Yong Joon. It’s fresh, delightful and tasty. Coffee beans are 100% Hawaiian, from Hawaii’s award-winning coffee producers. Also known for their Gorilla Frappe, a frozen mocha with a whole fresh banana blended in it. While you’re there people-watch from the outdoor seating area. Bills Hawaii is an eatery by Bill Grainger, an Australian celebrity chef, but you can still grab a great takeout coffee from the restaurant bar (upstairs). It’s modern, consistent and delicious. Coffee beans are a 100% certified organic blend by Stumptown Coffee Roasters of Portland, Oregon. Also known for ricotta hotcakes with banana and honeycomb butter. While you’re there check out the lunch and dinner menus, chances are you’ll want to return for a meal.